To tell about Kungri Monastery one needs to talk about Dzongsar Khyentse Rinpoche first. The Rinpoche is Bhutanese, holds the title of a reincarnated lama, and is a high ranking spiritual authority in his country. He is also a successful author, film buff and – under the nom de plume Kyhentse Norbu – a director (one of his movies, The Cup, about a group of monks who use their wiles and smarts to try and get a satellite dish in order to watch the Soccer World Cup, has been widely praised) as well as a man with a vicious sense of humour; as a lama he has the duty to choose auspicious names for every newborn in a ceremony similar to Christian baptism – several of the children come out of this ceremony with the perhaps not so fortunate names of Rambo Norbu, Flash Gordon Chozom or Jamyang Raging Bull. Like many influential lamas Dzongsar Kyhentse has taught abroad and has acquired a large European and American following. He is offering spiritual retreats to his followers, Western and Indian alike, and one of these retreats happened to be in Kungri Monastery. Kungri, located in the scenic and remote Pin valley, is called the second oldest monastery in Spiti, after Tabo. Founded in about 1330 AD it is the only Nyingmapa monastery in the region. The Nyingma, the oldest Buddhist sect, follow Tantric teachings. They are not as strict in their rules of consuming alcohol and having sexual contacts as the other sects, but consider these activities part of the spiritual challenge of life. Their lamas may, under certain circumstances, even raise families and a few rituals they follow occasionally culminate in wild performances, often accompanied by the participants falling into trance-like states. The monastery itself holds from fifty to three-hundred monks, depending on the season. It is a centre of learning and an important communal meeting place for the people of the outlying villages. Kungri used to be one stop on a trading route between Spiti, Manali and Lahaul, but a massive earthquake in the 1950s collapsed the established trading path and the valley has been a dead-end ever since. What used to be a monastery made prosperous by trade had to look for other sources of wealth. It may have been the contacts established by teachers like Dzongsar Khyentse that enabled Kungri to recently receive a sizeable international donation to restore their monastery. It certainly was Dzongsar Khyentse who was responsible for the large number of Western visitors that flooded Kungri in June 2010. He was holding a two-month long spiritual retreat and empowerment that filled the small monastery with European, American, Japanese, Tibetan, Bhutanese and Indian disciples. We arrived during the end of the retreat. It was marked by a large festival that drew villagers from all around Spiti and Kinnaur. Large private cars filled the courtyard of the monastery and the lanes of the ten hut strong village surrounding it. Busses were filled to the brim with families pouring in to see the lama and receive spiritual rewards. 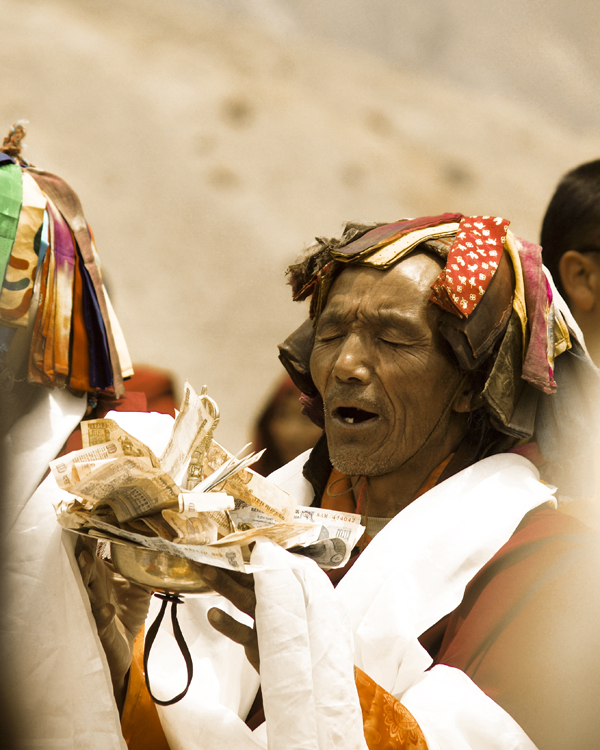 Traditionally it is believed that spiritual merit can be acquired by the right acts or by contact with people who have achieved a high spiritual standard, like leading lamas or sages. It is considered not unlike we consider our bank balance and monks often jokingly call a few thousand spins of the prayer wheels “acquiring interest”. In the end there were well over thousand people filling the monastery. After a bit of delay in procuring the guest of honour, troupes of dancers started a traditional Kinnauri/Spiti dance. Men and women are both dressed in ritual clothes, the men wearing a topi – a round hat – a long brown dress with embroidered blue cuffs, and are carrying curved swords. In the pacifist Buddhist culture the people of Pin Valley are the only ones using swords to accompany their rituals. The women wear a bright green cloth wrapped around their shoulders. It is embroidered with colourful designs. Those designs as well as the colours used vary from village to village, but in Kungri every woman is wearing the same set. Unlike the vigorous Shunto dance which is a dance popular in the regions of Spiti and Lahaul, the ritual dance is slow, almost soporific. Men and women line up opposite each other, then form a circle, at first the women to one side and the men to the other…soon, however, they mix, so that you see a woman next to a man next to a woman…All the time the dancers are accompanied by five musicians, playing drums and cymbals in a slow, steady rhythm. According to Buddhist statures the dances are described as releasing negative energy and creating a positive and harmonic mood among participants and audience alike and of course to honour the Lord Buddha. However, I think there is more to it. The swords would reflect the old martial culture of the valley tribes, always ready to defend themselves against intruders from Ladakh or the Sikh emperors of Kullu who raided their valleys a number of times during their history. Several people have also told me that there is a matrimonial significance and that the best dancers are also considered to be the best possible matches for marriage, so the young women and men dance for their future fortunes and prosperity as well as for the honour of the Lord Buddha. After a lengthy performance the monks brought out boxes full of chocolate and cookies. One can often see packs of chips and crackers and chocolate stacked up next to the deities and statues of incarnate lamas as ritual gifts, but this time the monks were offering the ingredients of those boxes to the gathered villagers as gifts. People started pushing each other and crowding the monks. Countless hands were reaching out for a desired packet of chips or Marie cookies, but the situation never became chaotic. Everyone seemed to leave satisfied, clutching a small or slightly larger bundle. The monastery would now offer another ceremony to prove its prosperity. A new monastery would be founded, about two hundred metres uphill from the old one. Queues of people were trudging uphill to a spot where incense smoke was rising and the dignitaries had already arrived via a short-cut with their jeeps. Up here the Buchan or buzhen lamas were set to perform. The Buchan are a local sect from the Pin Valley. They live in Mud, a tiny village, but spend their summers wandering the valleys. There is a buzz in the air up here. The people are excited about their performance. The Buchan are a group of nine men of differing ages, but most of them in their thirties and forties. They are robust looking people with the memorable faces of actors. The best way to describe them would be Buddhist harlequins. They wear costumes bright with tassels, sashes and belts. Around their necks are bells, women’s jewelry and metal boxes containing sacred relics. Three of them have already changed for a performance. It is a performance taken from an older age, a mockery of the establishment that reminded me a little bit of the German Fasching, when people dress up as caricatures and perform the pomp of the mighty in order to ridicule them. An effeminate, made up man was representing an aristocrat who ended up in a quarrel with a monk (bedecked with even more tassels, belts and bells) and a man who was meant to be a shopkeeper. I cannot offer a translation of their conversation, but from the reaction of the crowd it seemed to have hit the nail pretty much on the head. The people were giggling with laughter. When the Clown appeared their giggles turned into roars. The Clown was a man dressed in white furs and a white cap, his face painted white. He bore a whip an without an introduction he began beating the three men, chasing them around the stage and loudly cursing them and making rude jokes. The actor seemed to relish his role and wouldn’t leave even when the other Buchan appeared and gave the performance a more ceremonial note. He kept chasing a cymbal player and chewing the scenery for a while before he disappeared. The final performance is one that is usually only shown during the ladarcha, a fair lasting several days that is played out around Kaza in July or August. It is called the powar dochak, literally the “breaking of the stone”. The powar dochak begins with setting up an altar to Tangthon Gyalpo, commonly known as the “Great Builder” or, more poetically, as the madman of the empty land. He is a revered, semi-mythical lama who founded the Ache Lhamo, the Tibetan Opera and erected several iron suspension bridges in the Himalayans to ease travel through these inhospitable lands. In order to raise the money he founded a song and dance troupe. Today he is revered as the patron saint of drama and so of the Buchan. In front of this altar there is placed a stone. Then a sword dance begins. One of the Buchan, called the Lochen, carries two swords and begins a wild, swaying dance with them, jumping and whirling through the air. His dance gets increasingly wilder until he enters a trance. At that point he begins taking the tip of the blade into his mouth and spins around, later he puts the sword hilts on the ground, tips facing upwards and puts his whole weight on his swords. In this case the performer was so entranced that two of his colleagues had to catch and stop him. It continues with the eponymous stone. Placed in front of the altar this stone has now become refuge for an evil spirit and so it must be destroyed. An old man, ostensibly the leader of the troupe stands in front of the stone and begins to mumble and chant himself into a trance. Meanwhile another man lies down on the ground in front of the altar and the stone is placed on his chest. He is held down by several other men. Once the old man is ready, he picks up a large stone himself and – with a great flourish and a show of strength, he smashes the stone that harbours the evil spirit. At this point madness broke out. The audience, gripped by the power of the performance, raced towards the stage, hands frantically reaching for pieces of the broken stone. The pieces of the stone are considered to possess significant magical qualities and usually they are used in the plinth of new houses. The largest pieces of the stone would serve as foundation stone of the new monastery. The Buchan, their performance done, were literally showered with rupee notes. Dzongsar Khyentse Rinpoche used the opportunity to marry two of his Western devotees to each other – the couple had long planned this to be the beginning of their marriage – and posed for photographs with them. Soon after, however, the people dispersed and the endless silence of the Himalayan peaks descended over the place once more. Getting the bike back turned out to be a real odyssey. The fine of 300 dirham (a hefty fine for a student) had to be paid at the Royal Treasury, where a large number of people, some demonstratively dangling their motorbike helmets from their hands, were queuing for similar offenses. When Salmane’s turn came the clerk stood up, shut her window and said she was going for lunch. While we were waiting an incensed man almost single-handedly started a small revolution, shouting for a good ten minutes at another clerk who gave a good as he got. To the ears of the uninitiated even loving words sound like a quarrel when spoken in Arabic, while an actual quarrel has something of a storm and a deluge about it. But the man was smiling in between his bouts of anger. Two trips to impressively forbidding police stations to get the receipt stamped followed. Salmane’s brother, a taciturn doctor, picked us up in his car and drove us there. Salmane had mentioned him and that he had studied hadiths, the sayings attributed to the Prophet, in Saudi Arabia, so I was expecting a rather conservative and perhaps combative man, but he was clean shaven, sparse with his words and relatively unremarkable in appearance and simply didn’t seem to know how to deal with my presence. Then again, he had taken a “lunch break” from work to drive his youngest brother from a police station to the next, so any added distractions were probably best ignored. Having the necessary papers in hand he was sent off – with an uncertain goal. Apparently there were three places where confiscated motorbikes were brought and he didn’t know where his bike was and neither did the clerk who had stamped his form. His brother dropped us in front of a nondescript gate and drove off. There was a tiny window, barred with rusted iron and behind it loomed the face of an elderly man, screwed up in a permanent Piss-Off setting. He took the papers and turned out to be friendlier and quicker than his appearance suggested. While he worked over the papers, another trio of bike seekers arrived, greeting us with boisterous noises. “Do you like my body?” asked one of them, strong, tall young guy, quite out of the blue. I was momentarily puzzled by the question as he went through one or two half-hearted poses to show it off. Then the rusted gates swung open, interrupting us. Salman and I were admitted with another double-check of his papers and the trio that had arrived after us submitted theirs to a check from the gatekeeper. We entered and before us lay a wasteland of confiscated bikes. All size and shapes (most shapes exactly the same as Salmane’s bike, unfortunately, which seemed to be a popular model) filled the yard, haphazardly put together in rows and bundles with those at the far end looking like they would never be reclaimed by anyone. It seemed like a post-apocalyptic traffic jam after a catastrophe that had wiped all motorcyclists from the face of the earth. I looked over at the keepers, expecting them to produce some kind of paper on which the location of Salmane’s bike would be marked. Instead they lazily waved in the direction of one of the corners. Nobody had any clue where the bike could be. Salmane and I looked at each other for a moment, shrugged and went off to look for the bike. The only signs denoting anything at all were chalk-markings on the seat, showing the date when the bike was confiscated. Another clue was that Salmane had had to remove the pedal chain a few days ago, so we were looking for a bike confiscated on a certain date, missing a chain. This particular Moroccan-Austrian detective duo did walk all over the grounds, but eventually came across the correct bike. Salmane rubbed at the markings, but they wouldn’t come off. So he pushed the bike out, had a quick, light row with the guys at the gate who weren’t sure he had filled everything out, but then we were off, once more complete and motorized. The city belonged to Salmane again and he would show it to me. He spoke while we were riding along the roads of the city. “What are those holes for? The wall has holes – what are they for? You can guess.” Along with his bike he had regained his stentorian, school-masterly nature. We raced past the gates of the new palace and out towards the richer quarters, always outside the walls of the medina. The roads were wide here, and quite empty of cars. “I will tell you about the city and the people who founded and made it.” Salmane, you must know, has a prodigious memory. He learned the Qu’ran by heart when he was a child and repeatedly demonstrated it to me, reciting the subsequent lines whenever we heard a recitation on TV or on a radio in a shop or a car. In addition he was a great storyteller, understanding the power of images and conviction. 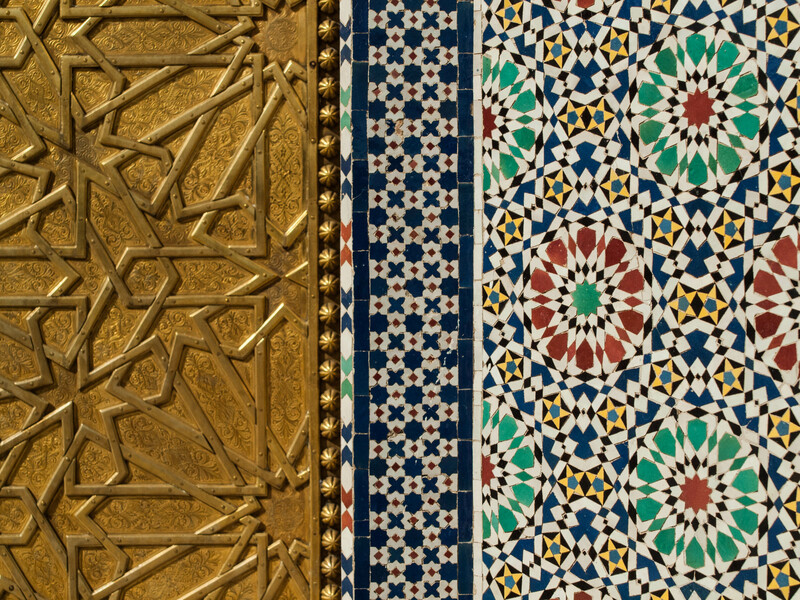 One of the first things we had talked about was how the story of Joseph and his brothers was different in the Bible and the Qu’ran (not at all, by the way), ending up re-telling the story to each other, filling in half-remembered details and scenes. I have never found much use for the Bible, to be truthful, but here it struck me for the first time how useful a tool of communication it is. Through the eyes and words of Salmane those stories became alive again. I’m not going to say that centuries of misunderstandings between Muslims and Christians vanished (and since I’m no Christian it would be a misleading analogy) because we sat and talked about a shared story, but I realized how far communication, shared knowledge and the ability to tell stories go in establishing mutual understanding. We could have talked about a movie or food in the same way, but because our experiences in those matters were probably very different we ended up talking about this ancient story. But there were more stories, dreams and visions. Islamic history is full of them. Hashish and opium have always been favoured pastimes. Rulers dreamed grand and decadent dreams and warlords nourished themselves on a harsher diet of curved steel, hard saddles and desert winds. Those are stories that are best told when in movement – the motorcycle ride was exhilarating. Later he made a deal with the warlord, only to be betrayed, watch his soldiers routed and be chased from the city. But the image of his dedication is what remains, certainly embellished, but also making everything else meaningless. Softness and harshness, always side by side. The soft naked soles gliding over musk and the boots of soldiers trampling the earth. We drove past the walls like the wind it was meant to keep out, along wide and almost empty streets, looking at the gates. It was through one of those gates that we drove and immediately we were swallowed up by a mass of people. It was a market in one of the poorer parts of the city. The word bric-a-brac very accurately conveys the shape of the produce sold here. People were throwing words and goods at each other and everything seemed so makeshift that a gust of wind could dissolve them all, stands and people alike. We scrambled through them and into the narrow streets of the Mellah, the Jewish quarter and poorest part of the old city. “This is the Mellah. If you come here at night, you do not value your life very much,” advised Salmane as he took a turn. Another motorcyclist came towards us and we nearly rammed each other. Dust and pieces of stone flew from a wall as we scratched it, not with our feet or shoulders, but the back part of the motorcycle. The motorcycle and its riders were unharmed. We continued through the narrow streets, cautious for a minute, then making robes flap in our wake again. The Mellah is not just a remnant of the past, nor is it a ghetto. 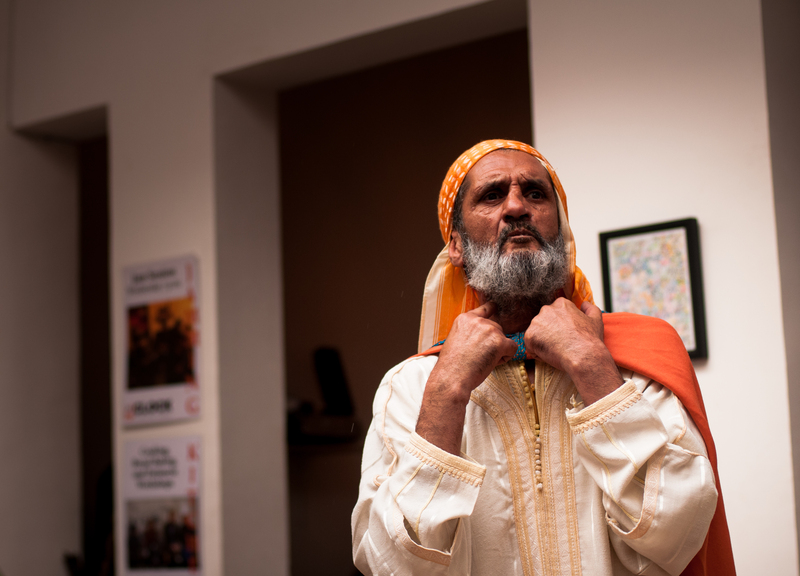 The historical relationship between Jews and Muslims in Morocco is not an easy one and the apartments in the Mellah are among the worst and most dilapidated in the old city. Drugs like kiff are as readily available here as anywhere else and it can only be the poverty and perhaps a spectre of the past that causes the bad reputation. On a later visit I was to meet a Moroccan Jew who worked as a performer on Jemaa el Fnaa, but this time my impressions remained fleeting as we crossed the quarter on the bike and shot out through another gate back into the flow of beige taxis and towards the outskirts where Salmane lived. I’ve been working in a bookshop for almost two weeks now. I do not like the moments or hours when I feel like a moderately intelligent zombie moving people towards books and books towards people, but I do like the often strange, weird, funny and sometimes surprisingly touching conversation you have with strangers who are looking for a particular book. I also have more patience for reading since my life has considerably slowed down (still not sure what to think of this). 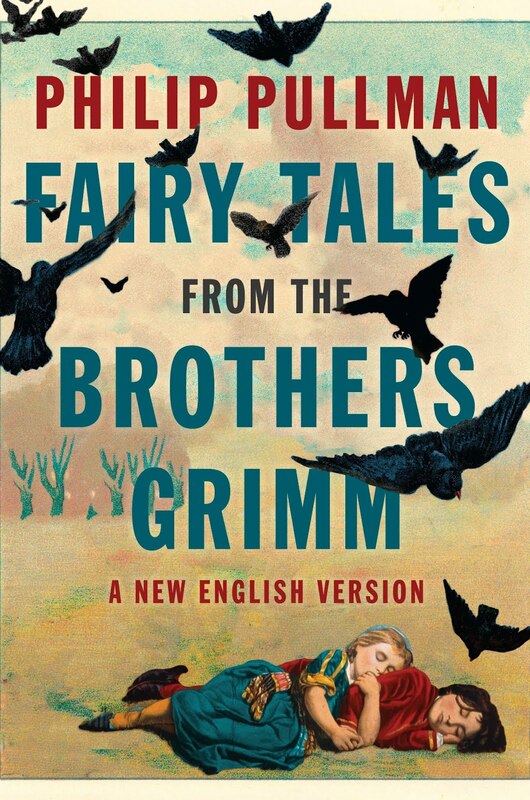 I finished Philip Pullman’s wonderful rendition of “Fairy Tales from the Brothers Grimm” today. It’s a bit odd to read translations of tales that I could easily read in the original but Pullman really brings out the beautiful storytelling that makes the tales so damn good. The same mechanics are used in almost every form of storytelling, movies, TV, advertisement…I found a lot of understanding how fairy tales work as well as heaps of inspiration for writing and for Dancing Tales. …speaking of which, I also finished Neil Gaiman’s “The Sleeper and the Spindle”. 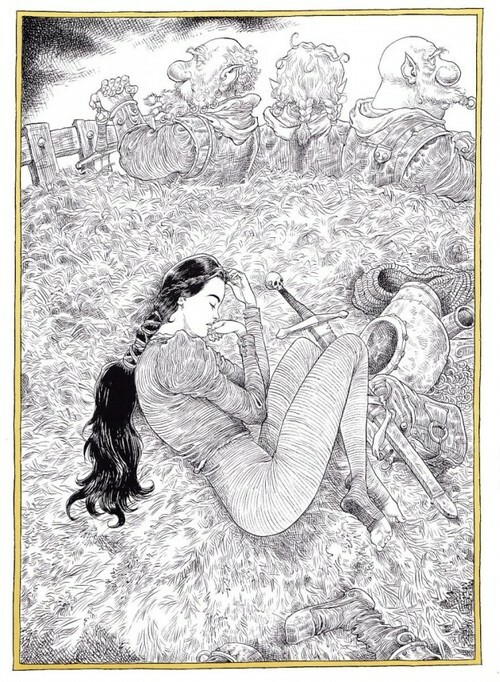 I don’t want to spoil too much and just say that if you go into the story after having seen Chris Riddell’s image of a sort-of Snow White kissing a sort of Briar Rose and think you know what you’re in for, you’re in for a surprise. It’s a bit like “Stardust” and a bit like “The Ocean at the End of the Lane”, just a lot shorter and it is a convincing new version of Briar Rose and quite a bit more (with gorgeous and delicate artwork). I’m currently writing a story that allows the reader to actively choose his or her path through the tale. This is an uncommon struggle for me because a story is usually finished, polished and then told. By a single person. That’s how it is given to a reader. A finished thing that is nonetheless dead without imagination. An active tale feels different. Unfinished, somehow. Or like several tales. This is a collection of thoughts – to get them out of my head and also as an offer to fellow storytellers or good readers to offer their own helpful, critical or inspirational thoughts. – The main character is, by necessity, an everywoman. I try to shape her by offering the reader little choices about her background…whether she comes from a healthy family background or not, whether she is interested in emotions, thoughts or actions etc. But it is impossible to define her much further than that because she is everyone who is reading the story. – There are no thoughts or severly limited thoughts, because you cannot offer the reader any guesses as far as motivation goes…everything is a clue that she must decide to follow or to abandon. The writer can only describe outward things and must make the reader guess what is behind them and make their choice accordingly. – The story needs to move quickly. Depth is hard to achieve, and only by action. – The pacing is more akin to a video game or movie. I only decide when and where to cut. I try comparing it to various practices of how to cut a movie. Do you show the whole action…beginning – climax – result…and then cut or do you build it up and offer the decision, the climax of the scene, to the reader? – Are there meaningful choices and can I allow a reader to make them? Do I offer moral choices? Allow the reader to choose sides? 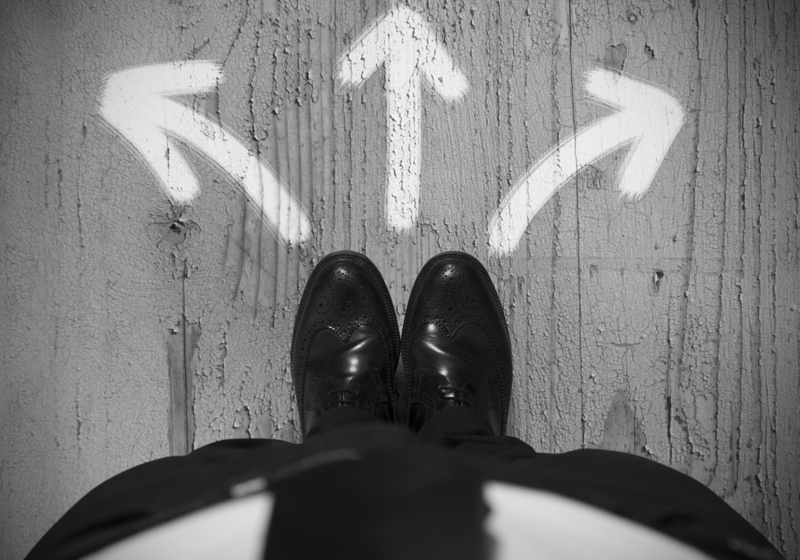 Can there be choices between different approaches? One emotional, another intellectual, a third physical? Is it possible to tell a story where I, the writer, make no choices myself and not have the story branch out into thousand unmanageable pieces? – Is it possible to tell a good story without full control over the story itself? Or does one simply need to tell several good stories and stitch them together seamlessly? – How much is illusion of choice? The reader cannot choose everything or she will derail the story. Stories work within limits. How much choice do you give someone to create the illusion of choice? – Like in a conversation, “Yes and No” questions quickly lead to dead ends. Choices between obvious opposites soon become uninteresting unless one subverts them or mixes them up. Choices need to have a certain level of unpredictability. „Meinen Schlafzimmerschlüssel,“ kommt die Antwort. Laut Tradition erzählt man mindestens sechs Joha Geschichten. Man erzählt sie im Wechsel. Zuerst der eine, dann der andere. Joha, den weisen Narren, kennt man in der ganzen muslimischen Welt unter verschiedenen Namen. In unseren Gefilden – in einer Überlieferung, die den Sufis zuzuschreiben ist – heißt er meistens Mullah Nasruddin. Salmane ist ein Literaturstudent in Marrakesch. Wir kennen uns seit einigen Jahren, nachdem er mir bei meinem ersten Besuch in der Stadt seine Wohnung zum Übernachten angeboten hat. Er brachte mich auf seinem Motorrad quer durch die Stadt und hat eine Neigung so wenig Schlaf wie möglich zu bekommen. Zwei Stunden Schlaf und der hektische Verkehr der Stadt vertragen sich nicht so gut. Salmane nahm mich auf seinem Motorrad mit zum Bahnhof und sagte mir, während der Fahrt, dass er kaum die Augen offen halten konnte. Das erste, was mir in den Sinn kam, waren die Geschichten von Mullah Nasruddin. Ich erzählte brav sechs am Stück, während Autos und Motorräder an uns vorbei durch die Strassen schossen. Salmane blieb wach. Am Abend zuvor hatten wir gemeinsam seine Bachelorarbeit durchgelesen. Die Übersetzung und Analyse einer traditionellen Geschichten aus seiner Heimat, abgeschlossen von einem Gedicht, auf Englisch verfasst, über das Erzählen an sich. Mit dabei war auch ein Studienkollege von Salmane, Mehdi, der uns seine Geschichte erzählte, von weisen Herrscher und seinen weisen Urteilen. Er hatte sie gelernt von Haj, einem Meister Erzähler, bei dem er in Lehre ging. Wenn man die Artikel und die Literatur der letzten Jahre betrachtet, herrscht darin ein melancholischer Tenor. Geschichtenerzählen ist verdammt, wird in den Wirren der Moderne verschwinden. Eine Zeit lang hatte ich mich derselben modischen Melancholie verschrieben, aber solche Gefühle kommen von der älteren Generation und spiegeln wohl zum Teil auch ihre Ängste wieder. Wenn Geschichten wieder lebendig werden sollen, dann muss das über die junge Generation geschehen, die in der Moderne lebt und sie weniger überwältigend finden muss. Mein letzter Besuch in Marrakesch hat mir gezeigt, dass das Erzählen absolut lebendig ist. Die Wege führten mich dabei sehr bald zum Café Clock. Ein interkulturelles Café in der Kasbah. 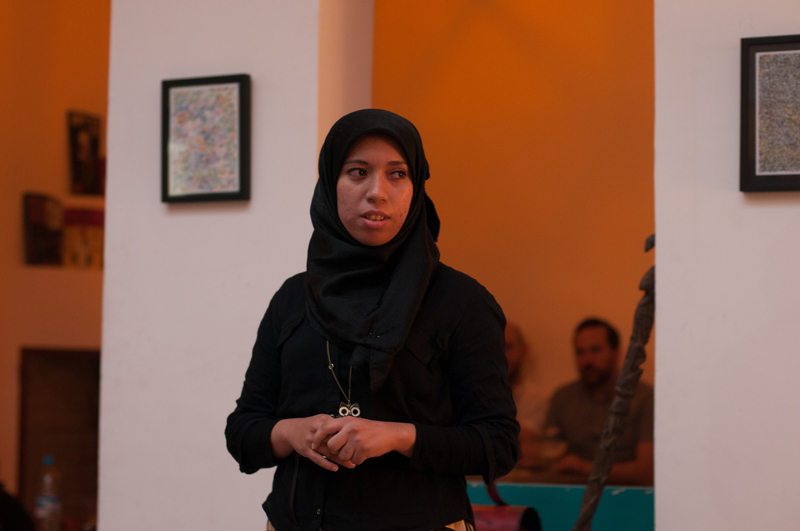 Eigentlich ist es eine Zweigstelle eines seit vielen Jahren in Fez etablierten Cafés, wurde aber von Beginn an mit eigenständigen und innovativen Ideen aufgebaut. Man mischt die marokkanischen Menüklassiker mit amerikanischen und europäischen Einflüssen durch, heuert junge englischsprechende Marokkaner als Personal an und zieht damit eine Mischung aus Touristen und jungen urbanen Marokkanern an. Das Café wird durch seine vielen Events, Musikabende und Hikayat – dem Geschichtenerzählen – zu einem wirklichen und lebendigen Treffpunkt zwischen zwei Kulturen. Das Hikayat ist für mich – und auch für die Leitung des Cafés – das Herzstück. Haj, ein versierter Geschichtenerzähler, der früher noch auf der Jemaa el Fnaa erzählt hat, nimmt eine Gruppe von Stundenten unter seine Fittiche. Sie alle lernen ein Repertoire an Geschichten, auf Englisch und Darija, dem marokkanischen Dialekt. Diese Geschichten führen sie im Café an den Hikayat Abenden auf. Das Projekt sucht sich ständig auszuweiten. Das Café sucht immer nach Leuten, die Ausbildung im Theater- und Schauspielbereich besitzen oder Sprechtraining und Bühnenpräsenz vermitteln können. Die Projekte dienen neben dem Erhalt der Erzähltradition auch der Stärkung von Frauen in der Gemeinschaft und dem sozialen Gefüge Marokkos. Für ein Projekt, das vor einiger Zeit erfolgreich abgeschlossen wurde, gingen die zwei Erzählerinnen an eine Schule für Mädchen. Sie erzählten dort mit den Schülerinnen und ließen sie ihre eigenen Joha Geschichten erzählen – bloß dass Joha hier ein Mädchen war. Ein paar Tage bevor ich das hier schreibe waren Hajs Schüler zum ersten Mal auf der Jemaa el Fnaa und seit vielen Jahren konnte man auf dem Platz wieder Geschichten hören. Zum allerersten Mal auch aus den Mündern von zwei Frauen, Malika und Sahra. Die beiden sind die ersten Frauen die in der langen Tradition von Erzählern auf der Jemaa el Fnaa ihre Geschichten preisgegeben haben. Die jungen Erzähler und die Tradition, die sie beleben, stellen für mich eine enorme Inspiration dar. Es ist schön mit Menschen zu sprechen, die Geschichten ernst nehmen und ein kleines Stück ihrer eigenen Tradition tragen wollen und können. Es sei jedem Besucher von Marrakesch ans Herz gelegt, am Donnerstag das Café Clock zu besuchen und das Hikayat selbst zu sehen. Eine Version dieses Artikels erschien 2015 im Südwind Magazin. It’s almost like a nervous tick. Check facebook – check your emails. Things are moving. If not, get them moving. Moments devoted to oneself are considered unproductive, selfish isolation. You are a hive being. Everyone is just one click away. You need to remain in constant contact with everyone or they will forget about you, eradicate you, take all value from you. Do they like this? Do they like that? 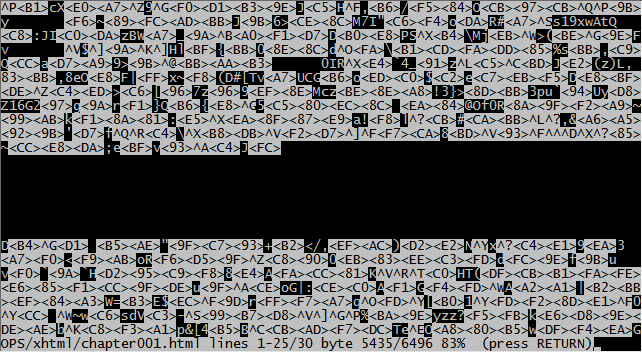 In the morning you stumble, bleary eyed and tired, to your computer. Coffee is a rush for your body, but online is a rush for your mind. You are no longer alone, no longer forced to watch your dreams, desires and failures play out in your head. They are right in front of you, subsumed and mixed with the desires of everyone else. You can watch your dreams rise and fall in real time. How many people like this? How many people will come to my event? What is trending? It’s always on your mind. Makes you itchy and restless whenever you enter one of those strange patches where your drug cannot be supplied and you’re forced to be offline. You are so meaningless in those moments. You realize that your public persona – now it has a name again, thoughts rise, your own, not the hive thoughts…but everything will be forgotten again under the rush of incoming information – your public persona has forgotten your private persona. Severed itself from it. Cut the virtual umbilical cord. Your public persona is all that exists, apart from this…this madness. All those thoughts that you cannot write down, nor present in a clear light. Your unlikable side. This darkness that needs a name. This is inside. Private. Private. It takes you on a dizzying spin…for a second. Then wifi pops back up. You can connect. Rush. Facebook like a deluge of senseless information. Not nonsensical, but senseless, since none of your senses apart from the visual will ever process it. It numbs you once more. Makes you deaf to the voice of your private self. Feeling is reduced once more to little flickers of knowledge on the retina of your consciousness…your consciousness is now one big eye, of course…networks and synapses that mirror the networks you aim to build are inside of it. Red likes and message numbers are momentarily mistaken for blood – but of course there is no blood here. A rush runs through you as they flicker up and up…you must have hit a virtual nerve. You ask a friend “Are you online” and need a moment to realize that he is sitting right next to you. Distances become meaningless, after all, even very short ones. Your nervous tick now manifests itself in random likes and terrible spelling. I have no time, comes over you like a disease and you would never guess that it is simply your body momentarily remembering its mortality. Instead you rush even more, take on more tasks all of which you will leave half finished. Your body is beyond tiredness already and claws the spirit back from the virtual world to envelop it with sleep. It tries to get it used to being corporeal in the several hours that the two spend together sleeping. You would never guess that your mind and your body are sharing a bed like two lovers fallen out with each other. Von 12. bis zum 27. August findet in Wien im West46 eine mehrwöchige Ausstellung namens Terranigma statt. 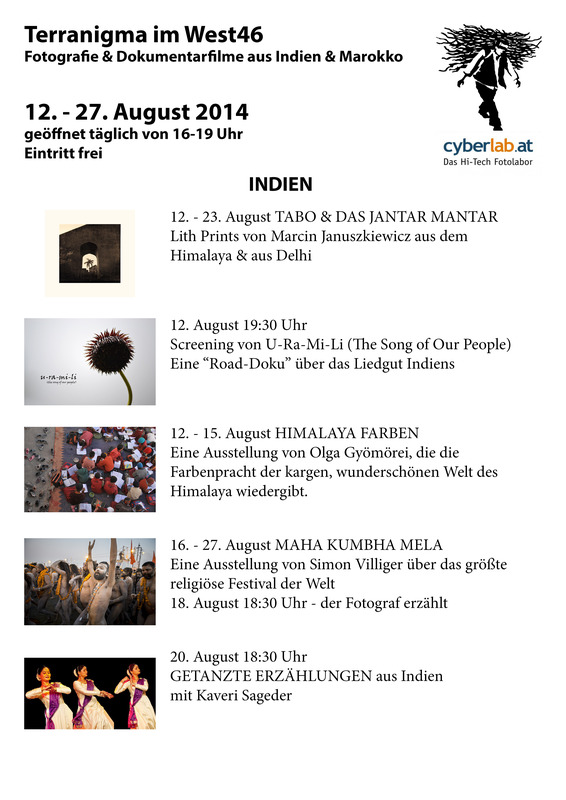 Wir zeigen Fotografie und Dokumentarfilme aus Indien und Marokko. Daneben gibt es auch Abende mit Erzählungen und Tanz – wir kombinieren die zwei uralten Formen und geben ihnen einen modernen Touch. West46 findet man in der Westbahnstrasse 46, 1070 Wien. Die Ausstellung ist jeden Tag von 16 – 19 Uhr geöffnet und der Eintritt ist frei.